You are here: Home / Blog / Which milk is the best? Which milk is the best? Lately, a raging controversy has begun with regard to the benefits of raw milk as against pasteurized milk. Curiously, many believe that raw whole milk is a more nutritious, tasty, and natural food while pasteurized milk is depleted of nutrients. Before, we get into the intricacies, it must be mentioned that the more natural food is, the more nutritive and the better it is for us. 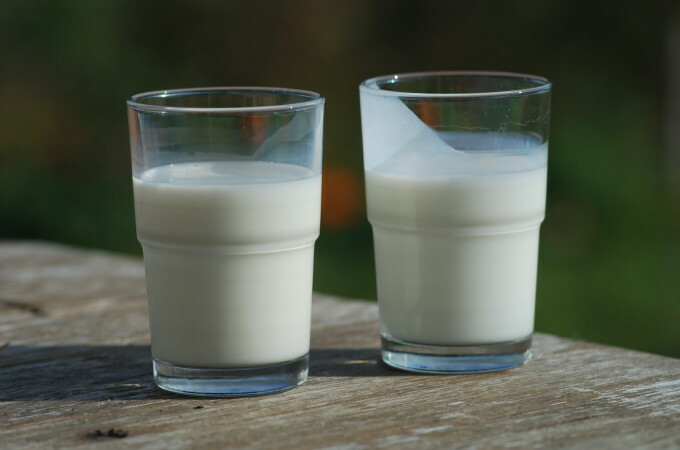 However, talking about consumption of raw milk, it is essential to remember that the risk of contamination by certain harmful disease-causing bacteria such as E.coli or Salmonella is a strong deterrent against its use. Going by the current trends, a large majority of consumers worldwide prefer to consume milk after boiling it not only because they think it is safe but also that it goes well with many of the recipes that are made at home. In view of this growing tendency, the present article focuses on a comparative assessment of the properties of boiled whole raw milk vis-a-vis pasteurized milk. Boiling of milk involves heating at a temperature of around 100ᵒC which makes it safe for consumption by killing harmful bacteria. During boiling, the fat content in milk rises to the top which is then skimmed off. In some countries including India, the milk containing skimmed fat is used for preparation of fermented product known as ‘curd’ or Yogurt from which butter is extracted for direct consumption or after conversion to ghee in various preparations. HTST Pasteurized milk (“high-temperature short-time“), the industry standard of pasteurizing, on the other hand, is prepared by heating milk to 76ᵒC for 15 sec followed by cooling which kills all bacteria thus making it safe for use and prolongs its shelf life, but does not completely break down the proteins to simpler amino acids. In the case of homogenized milk, milk fat is broken up into tiny globules which ensures uniform distribution of fat throughout the milk, which in turn modifies the composition of the pasteurized milk. Now, let us examine the essential differences between the qualities of milk processed by these methods. In case of 2% fat milk or completely fat free milk, fats are separated from the milk, the fat-soluble vitamins like, A, D, E, K and carotenoids are also removed which in turn disturbs its natural synergy. Without these vitamins, calcium in milk is not absorbed by the body thus depleting the body of these essential nutrients in the long run. During homogenization (homogenized milk), the lactose sugar in milk undergoes modification, making it easily absorbable and thereby increasing the glycemic index of milk. This could put extra burden on the pancreas especially in diabetics. Boiled raw milk does not alter the lactose composition and hence could be considered safe for consumption when used in moderation. In contrast, boiled whole raw milk contains the full complement of fats. Therefore, the fat soluble vitamins and calcium are easily absorbed by the body. Butterfat is composed of short- and medium- chain essential fatty acids, long-chain trans palmitoleic acid, conjugated linoleic acid (CLA) and Omega-3 fatty acids all of which help in fighting disease and developing a strong immune system. Increasing evidence gathered from recent studies show that whole raw milk with its full complement of saturated fats does not lead to increased risk of coronary heart disease as was thought earlier. In view of this, 2% and fat free milk are being devoid of fat soluble vitamins clearly suffers from a drawback. Boiling the whole raw milk makes it easily digestible by breaking down proteins into simpler amino acids which are then absorbed naturally. In contrast, homogenization of milk after pasteurization reduces the size of fat globules and proteins so much that they directly enter the blood stream causing irritation of arterial walls. Consequently, plaque grows over the irritation as a protective barrier leading to unhealthy consequences. Both pasteurization and boiling destroy vitamins and denature proteins reducing the nutritive value of milk. However, it is estimated that the nutritional value of boiled whole raw milk remains superior to that of HTST pasteurized milk and homogenized milk, in terms of overall vitamin and mineral contents. Summing up, the verdict from the available body of evidence seems to be clearly in favor of boiled whole raw milk due to its higher nutritive value and health benefits. And, in terms of safety also, it is very much comparable to HTST pasteurized milk as long as all the necessary hygienic measures in handling and storage are followed to the hilt. There is so many varieties of milk, whole milk, fat free milk, homogenized milk, pasteurized milk and the raw milk. But, which Milk is the best?